We took a short look at the upcoming adventure horror title Til Morning's Light a couple of days ago, but there was a lot to the game we couldn't get to. To help rectify that, we asked two of the game's lead developers Mariel Cartwright (Skullgirls) and Adam Tierney (Aliens: Infestation) about creating the game, their influences (Coraline, Fatal Frame, Silent Hill), why there are so few core horror titles for phones/tablets, and a lot more. Maybe more importantly to you Kinuko/Skullgirls fans out there, we also managed to score a lot of her production/promotional artwork for the game, found below. I really hope that Til Morning's Light is a hit, not only because it's fun, but also because that would increase our chances of getting an all new, hand-animated entry in the series. There are few animators in the business as vibrant and talented as Mariel Cartwright. Tell us about the origins of Til Morning’s Light. Where did the concept come from and how did you two get involved? Adam: It started as an original WayForward pitch that Mariel and I teamed up on 5 or 6 years ago. In fact, I think it might have been the first project we worked on together. Mariel: I had just gotten started working with WayForward at the time, as one of my earliest game industry gigs. I do a lot of art for WayForward’s game pitches, and this was one of the first ones I did art on! I always thought it was a cool concept so it was great to see it come back after all this time. Five years is a long time. What changed about the concept between that initial document and the game you ended up making? Adam: Not as much as you'd think. From the beginning, the main character was always a teenage girl named Erica, locked in a haunted house, trying to survive overnight and escape by morning. The enemies were different - just bugs and rats and bats, from what I recall. And the concept was originally envisioned as a 2D sideview game (like the original Clocktower), whereas the final game is fully 3D. But thematically, it didn't change much. Mariel: Yeah, surprisingly, from my end the biggest thing visually that changed about Erica was her outfit. It was actually fun to revisit just a few drawings I did back then and really try to bring that character to life. Can you talk about each of your roles on the game? Mariel: I was the lead concept artist. I designed Erica, the NPCs, and most of the creatures under Adam’s direction. I also storyboarded all the cutscenes in the game, and did a few bit illustrations you’ll see in the game. Adam: I wrote and directed Til Morning's Light, and led the design team. I basically oversaw all creative aspects of the production, working with all the artists and coders as they implemented everything. How would you describe Erica? What did you hope to accomplish with her? Adam: I've always loved the standard setup of a young female protagonist in horror games and films. 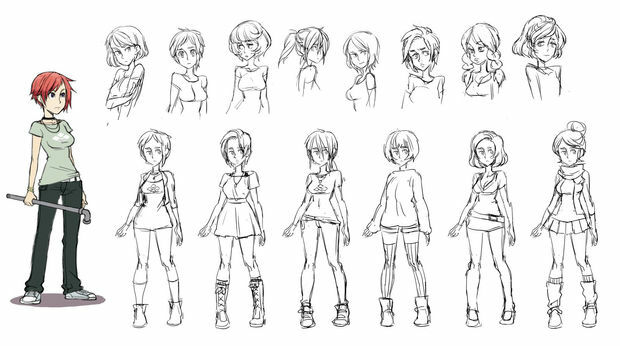 In the original pitch, we had a very clear visual for Erica (from Mariel's art), but she didn't have much of a defined personality back then. 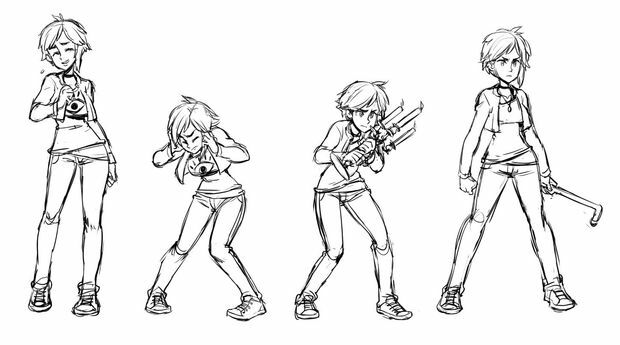 After the game was signed with Amazon Game Studios, we came up with the idea of making her very meek and timid at the start of the game, then slowly evolving her to be more aggressive and powerful over the course of her adventure, so that the girl who came out at the end would feel like a completely different character. Mariel: I think Erica is someone that a lot of girls can relate to— smart, self-aware, but shy and afraid to stand up for herself. Adam: Stephanie Sheh (who voices Erica) really brought Erica to life as sort of a cute dork. Once we heard her take on the character, all remaining dialog was written with that personality in mind. So Erica got a little more hammy and sarcastic as production went along. 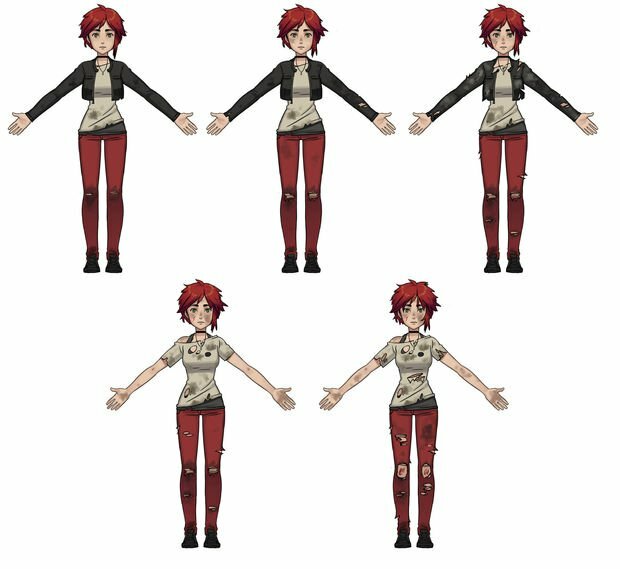 In what ways does Erica “evolve” over the course of the game? 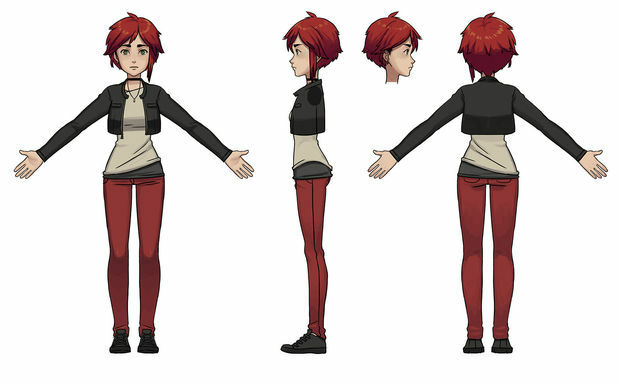 Adam: In terms of VO and story, she begins the game timid and easily-frightened. Her wit and sarcasm is still there, but it's less confident. As the game progresses and she has to defeat all these insane bosses and creatures, Erica gets more and more frustrated and aggressive, so that by the end of the game she's the strongest person in the house. It was a lot of fun to build a story around the idea of your main character slowly evolving over the course of 12 story hours. Mariel: She also changed visually as well - starting with just her normal outfit at the beginning and becoming more tattered, dirty and messy as she progresses through the house. It’s a cool way to evolve her both mentally and physically and show how far she’s come. How would you compare Erica to other WayForward characters? Adam: She's much more subtle than most of WayForward's heroines. With characters like Shantae, Patricia Wagon, and Kebako (Cat Girl) you have very loud, action-packed, dynamic personalities that hit the ground running. With Til Morning's Light, there were still the usual WayForward sensibilities (especially in the visual design and gameplay), but we wanted a very slow build of the characters, and a slow reveal of plot points, with more emphasis on emotional highs and lows than we typically include in our game stories. Mariel: Yeah, Erica is less cartoon-y and more relatable of a character, I think. I definitely I see a bit of myself in her and I’m sure many others will too. Is Til Morning’s Light a “horror” game? How scary is this thing? Adam: Most people would consider it a horror game, I think. "Spooky" might be a slightly more accurate term. There are lots of unsettling, creepy moments, but there's no real blood or gore. If you've ever seen the film Coraline - which is kind of a film for teens, although there is still real risk and death - we're tonally pretty close to that, but maybe a little bit older and darker. I'd say our bosses are probably the scariest thing in the game - even though they're each charismatic (in their own ways), they're also a tremendous, deadly threat to Erica. What’s the gameplay like? Is it a mix of action and puzzling? Adam: Yeah, the game is equal parts exploration, combat, and puzzling. You explore the mansion grounds, which spans over 100 unique locations. Advancing through the game is very lock-and-key driven (in typical horror genre fashion). Combat is rhythm-based, using a touch input system of taps and swipes that get more complicated and challenging as you advance. And puzzling involves a little of everything - deciphering clues, finding pieces, combining and manipulating objects - everything you've come to expect in this genre. Mariel: Erica is a normal girl that’s been thrown into a crazy situation, so she doesn’t have an arsenal of weapons to blow up her enemies. She instead has to rely on what she has, which is basically just herself, so the combat and puzzles were designed around that. Are there any unique features in the game you can talk about? Adam: Most of the ghosts you encounter in the game are friendly. As a general rule in this game, ghosts are good and creatures are bad (and it's explained why through the story). But occasionally you'll come across a ghost that's lost and attempts to flee from Erica. These moments provide a game-long secondary objective to locate and essentially rescue all the 'lost souls' in the game (ghosts without memory of who they are or where they come from). This process involves first revealing the ghost by using the camera on Erica's phone (a mode that's enhanced in the Fire phone version of the game), then after the ghost is revealed, chasing it around the area until Erica absorbs it. Performing this process on all lost souls in the game yields a very special reward. What’s the story like in this game? And how did that come together? Adam: As I mentioned, it's really all about Erica. Although there are over a dozen speaking characters in the story, the story revolves around her. And even the types of secondary characters we included were done as a way to highlight different aspects of Erica (romance, confidence, being a child, being an adult, etc). I'd say the story legitimately runs the gamut of being very funny at times, then very unsettling, then very depressing, and ultimately a (hopefully) very satisfying conclusion. Mariel: I did all the storyboards, so it was important to really show how she changed from scene to scene. 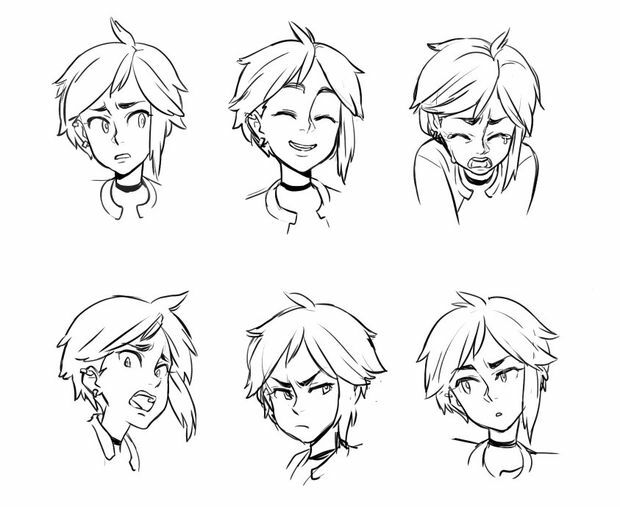 Everything from her expressions, posture, and appearance changed as the story progresses, so I’m hoping people really relate to that. Adam: The story was developed between WayForward and Amazon Game Studios. As a publisher, they are very collaborative and tend to assign 'experts' in each area of the game. So rather than me working on the game's story with only producers, they had a story expert who would go back and forth with me on plot, characters, and drafts of the script. The process was very exciting, and I think the story and dialog we ended up with is more developed than if we'd just put it together on our own. The game is getting a release on iOS, Fire phone, and tablets. Were there any challenges in making a game like this for mobile devices? Adam: Not really challenges as much as things we needed to keep in mind. 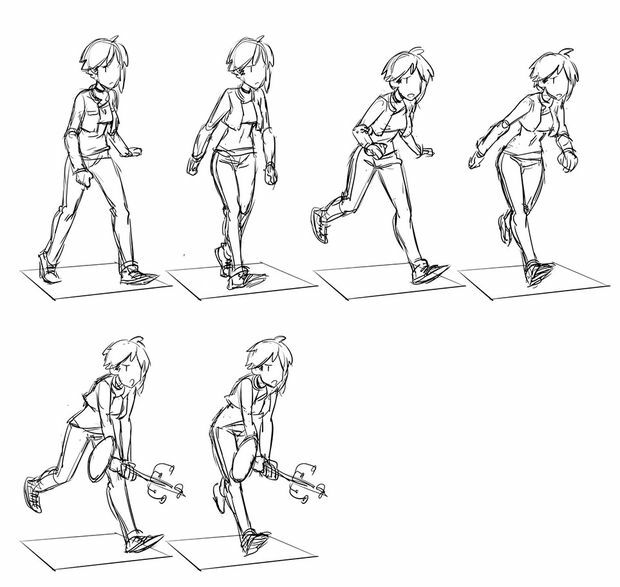 Thematically, there are a lot of complex actions Erica performs in the game. But we wanted the game's controls to essentially support single-touch throughout the adventure. So boiling down a fairly complex, traditional horror game design to a handful of single screen taps took some real thought. The combat, as I mentioned before, is rhythm-based, and this came from us experimenting with a variety of different approaches early on. Initially, we tried combat that was directly-controlled (hit for hit), but to get that feeling good on a mobile device, we had to essentially overpower Erica (which worked against the game being a horror title). So, we ultimately went with a minigame-like rhythm interface, similar to Buddha Finger or Elite Beat Agents. Once we did that, we were able to have tight, challenging combat, but still keep Erica as only a semi-confident combatant. How is TML different from other action-adventure games offered on the iOS and Fire devices? Adam: First and foremost, it's a really meaty game. I think gamers will be surprised by just how much content is here - story, characters, locations, secrets, battles, etc. It feels like a console experience shrunk down for mobile devices, rather than the more bite-sized adventures you often see on mobile. There also doesn't seem to be a tremendous amount of deep horror games on mobile devices. There are a few that attempt this – Amazon Game Studios just shipped another great horror game, Lost Within, on mobile devices a few weeks ago. But overall, I think most publishers and developers don't attempt the genre on mobile because they doubt the possibility of something being creepy and immersive on a tiny screen. Hopefully Til Morning's Light will go toward proving that these types of games are very possible, and work well, on mobile devices. How has working with Amazon on this game been? 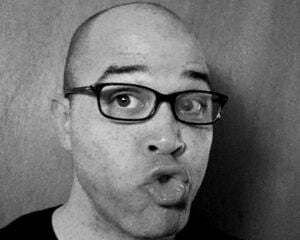 Adam: Amazon Game Studios has been a dream to work with. They're very hands on, but at the same time never interfered with the process or put up walls. I think their primary goal is to understand the kind of game that the developer is envisioning and then do everything they can to help realize that vision. Whether we were tackling story or combat or puzzling, I don't recall ever getting any mandates or notes I disagreed with (which as publisher, would be completely within their rights to do). They just sought to fully understand what this game was all about then use any and all expertise they had available to help make it as great as possible. I look forward to working with them on another project in the future. Were there any previous games in particular that influenced your work on Til Morning’s Light? Mariel: Oh man, I love horror games— Silent Hill, Clock Tower, Resident Evil, Fatal Frame — with a soft spot for ones with female protagonists, like Haunting Ground. I love stories where a normal girl is thrown into a terrifying situation and has to fight her way out, so I tried to channel that into Erica. Adam: I've loved horror games and films ever since I was a kid, so I'm sure it all had a subtle influence on this game. My project previous to Til Morning's Light was a Silent Hill title, which is my favorite game series. So SH fans might note some similarities in this game. The same goes for Resident Evil, Luigi's Mansion, Castlevania, Metroid - anything creepy with room-by-room progression. Who’s the target audience for this game? Adam: Core gamers, the same people enjoying the best games on PS4, Xbox One, Wii U, and Steam PC right now. From the beginning, Amazon Game Studios let us know that this product should appeal primarily to core gamers, which is why Til Morning's Light is a very robust, console-like experience. Obviously we tailored the controls to what works best for mobile devices and tweaked some of our design implementations based on how people enjoy mobile games. But the goal was generally to create something very substantial and immersive. At the same time, there's no real blood or gore in the game. So although it can get pretty dark and unsettling and tense at times, younger gamers who aren't easily frightened should also find the game appropriate to play. Anything else you want to let our readers know about Til Morning’s Light? Mariel: I’ve wanted to be part of a horror game for a long time, so it was awesome to be given the opportunity to work on Til Morning’s Light. I can’t wait ’til it’s out so everyone can see what we put together! Adam: This is the most personal game I've ever worked on, and the talent on this team was some of the best that WayForward's ever put together. I can't wait for gamers and horror fans to check the game out, and hopefully it resonates with you all the same way it did with us.